The Q&A that you remember, was actually answered by us-Fox Country Sheds. In addition to our stellar reputation for constructing quality sheds using quality materials, we also pride ourselves in assisting homeowners in selecting the right shed for their needs, their style, and their budget. One of the main considerations in selecting a storage shed is to consider exactly what your needs are. We can help you to determine exactly what you desire to store, and then discuss building materials and specifics. Are you looking to store a few handheld garden tools such as rakes, pruning shears and a push mower? Or are you looking for a larger structure to store a riding mower or tractor? Perhaps a motorcycle or bicycles, or even fun jet skis or snowmobiles? Are you looking for a structure to use as an "in-home office" or "mancave" or even a "she-shed"? If you plan on spending a lot of time in the structure, some of your selected building options might change such as insulated windows and insulating the walls and floor. The building specs used in all of our sheds start with the same quality materials, and the customer can upgrade certain options to meet their needs accordingly. Once you have determined what your structure will be used for and what size would work best for you, it is important to give equal attention to the foundation or "pad" where your shed will be placed. A great, well-prepared foundation truly is the first step in a quality storage shed, which should last you for as long as you own your home. We are happy to provide guidance for the handy homeowner who wishes to do the site preparation on their own, but our recommendation would be to not skimp on this step and to let our professionals take care of this important step for you. All of our sheds, no matter the size, are built with the same quality craftsmanship which we are known for, from the skids to the shingles. Pressure-treated lumber is used for all ground contact areas, what we refer to as "the runners". We go the extra step and use pressuretreated floor joists, as well. The interior plywood flooring can be easily upgraded to a pressure-treated material, and we can help you determine if this is something that would suit your needs. Selecting your exterior material is easy-the homeowner has a choice from a quality vinyl siding product, or a durable wooden siding material. Both have long-term warranties from their specific manufacturers. The vinyl siding comes in a number of popular colors, and the homeowner is sure to find one to match or complement their current home, or we can custom order a specific product for you. For the wood siding, we use an industryspecific "barn paint" which offers excellent coverage in a number of popular exterior colors. The discriminating homeowner who wants more than a shed may want to upgrade certain components, such as selecting our 9-lite steel door, or even a full-glass door option which would look great on a pool house or "sheshed". For extra insulation and security, we even offer a vinyl insulated window and pre-hung door option, exactly the same type you would install in your home. Last but not least, let's consider the shingles or roofing material of your shed. Our standard roofing material is a 30-year architectural shingle, which is certainly something that any discriminating homeowner would expect. We do also offer the option of a metal roof which is very popular for certain shed styles. Both roofing options are installed over a high-grade plywood sheathing and are available in a number of standard colors. Be sure to top off your new, quality-built shed, with an attractive cupola and weathervane, both available in a variety of options to suit your style. Our informative sales staff is always available to answer any questions you might have about the quality materials available for your new shed, garage or other backyard structure. Give us a call or stop in to see us! The most common suburban front-yard landscape solution is to decorate the house, creating a facade with foundation plantings to be viewed from the street across the front lawn. This "outside-in" approach prioritizes the perspective of passers-by, and helps to sell homes. However, when plantings are used in this way, primarily as a stage set, you, the homeowners receive minimal experiential value from your most-used perspective, your windows. You look outside and see the cars on the street across the lawn. You miss the refreshment of daily interaction with an inspiring garden sanctuary, and the peace that comes from privacy. As garden builders, we recommend improving your front yard landscaping by taking an additional step, considering an "inside-out approach" that prioritizes the perspective of the people resting, playing, studying, living in the home. What you see and experience when you look or step outside is also important. Rather than just planting a two-dimensional facade around the footprint of the house, our suggestion is to provide multi-sensory experiences in multi-dimensional outdoor living spaces-"garden rooms" which are seen from the windows, and where children of all ages can clamber or rest, listen to the sigh of wind in Pines, feel the variant textures of pathways and dewy grass underfoot, and smell the exhilarating fragrance of new leaves. This approach incorporates plantings and garden elements in ways that can be enjoyed and experienced by those in the home as well as those passing by. So, in addition to curb appeal, the view from those new windows should be considered. For example, a carefully-planned entrance garden will serve both objectives, adding depth and perspective to a home's curb appeal while providing interest for those who live inside. To have a garden that is experienced and enjoyed inside and outside the home evokes the feeling of being in a rare and special place for which curb appeal is only the first hint of discovery. Over the years, R&A has published several very informative articles and beautiful photos submitted by Kreider Canvas Service promoting their awning and canopy business. While the idea of expanding our patio usage during rainy weather or blistering sunshine through the use of a canopy is very appealing, we just don't have the time nor the energy to deal with the annual requirement of putting it up and taking it down. Is there a solution? Answer provided by: Les Kreider, President–Owner, Kreider's Canvas Service, Inc. Yes, I'm happy to report that there is a solution. And by the way, thank you for your nice comments about our editorial contributions to this magazine. Many area homeowners are beneftting from the use of awnings and canopies to expand their usage of their porches, decks, and patios. As we've mentioned in several of our past articles, awnings and canopies not only allow homeowners to expand their home's usable areas, there are also signifcant energy-savings to be gained as well as protection from sun damage to furniture, window treatments, and ﬂooring. Now, in answer to your question, yes, there is a solution for busy homeowners like you. Here at Kreider's we offer full-service annual installation in the spring and takedown in the fall. And, if needed, we also provide worry-free winter storage. Here's how it works. Spring is a time to clean away the winter mess and get ready for outdoor living. When our trucks begin to move through the local neighborhood folks begin to get excited because they know warm weather is on the way. A patio covered by a Kreider’s canopy is a happy patio!! We take pride in providing you with top-notch service for your awning and or canopy. You will fnd us to be friendly, helpful and on-time. Awnings and canopies that we service are guaranteed to have a drum tight ft with as few wrinkles as possible. Awnings that are installed properly will last longer because they will not “pool” water or ﬂap so much in the wind. Care will be given to avoid stepping on ﬂowers, railings or outdoor furniture. Our teams strive to leave your home looking better than when they came! Clients are encouraged to call as soon as possible to schedule their spring rehang. For the most effcient and worry-free service experience, ask to be added to the Auto list. We generally try to have the rehangs completed between April 15th and Memorial Day. As summer wraps up and kids go back to school and the leaves start to showcase their beauty our teams gear up for the fall takedown season. To give your awning the longest lifespan possible it should be taken down prior to any snow and ice accumulation. Typically when the days grow shorter and cooler you will be excited to have the extra light and warmth ﬂooding in through your windows. An awning or canopy that is removed by Kreider’s will be carefully inspected for holes, tears or other issues that may need attention. Should you choose to have your awning stored by us, it will be tagged and warehoused within our clean, dry and rodent free storage facility. As with our rehangs, clients are encouraged to call as soon as possible to schedule their fall takedown. And, yes, like the rehang, we suggest that they get added to our Auto list. We generally try to have the bulk of takedowns completed with-in the month of October. So there you have it...professional and courteous help is readily available. Make the most out of your outdoor areas and realize some serious energy-savings in doing so by expanding and extending their usage. For more information on awnings and canopies, please give us a call or visit us online. As a parent of two boys who are now grown, I certainly remember the days of trying to keep them busy at home, while making sure that they remain safe and within eyesight. At that time, I had invested in a rickety metal swingset that seemed to shake, rattle and rust with each swing and climb my boys made. I can honestly say that it probably wasn't the safest nor the most secure option, at that time. The backyard playsets of today have improved in many different ways. Safety is always a key factor, and all of the vinyl playset products which we carry follow strict safety protocol. You can indeed have peace of mind knowing that your playset manufacturer places priority on the highest quality materials and construction, as well as safety features. Some of the standard safety features of today's playsets which you should look for include: smooth, splinter-free vinyl coating and sleeves, entrance ladders with safety rails and nonslip steps, pinch-free rubber coated swing chains, heavy-duty hangers and fasteners, powder coated brackets to resist rust. One of the reasons that our playsets are so popular with families of all sizes is that you can customize them. The designs range from the simple 4x4 tower with a 2-position swing beam and a slide, to a complex multi-level and multi-tower design with numerous swing beams, assuring that each child of every age has a fun activity to explore. These playsets are built to last and are designed with fun options that can grow as your child grows. As your child grows, a baby swing can easily be swapped for one of the many big-kid swing options. You can easily arrange a variety of slides, twisty slides, towers and playhouses to maximize your child's outdoor excitement. What child wouldn't be happy playing on a set named the Giggle Junction? Children of all ages would enjoy swinging on the tire swing, or imagining that they are climbing Mount Everest as they ascend the rock wall. The Discovery Depot playset designs feature multiple towers of various levels, for those children who love to imagine they are world explorers. Playset packages come in a variety of sizes suitable to fit into smaller yards, as well as more elaborate designs for a sprawling backyard. No yard is too small for one of these quality, customizable playsets. Lastly, a concern we hear often is parents wondering just how long this type of investment will take them as their children and family grows. We are so proud of the Limited 20 Year Warranty offered by our playset manufacturer, Adventure World Gymsets. You can view more information about these quality backyard vinyl playsets, towers and playhouses, and even customize and order your own set, right on our website at www.FoxSheds.com. Of course, our helpful sales staff is always available to help you customize and design a playset to meet your budget and your family's needs. When we bought our home six years ago, our two–car garage was a great luxury. Back then, we actually used both bays for parking. Over the years, however, due to the growth of stuff such as lawn mowers, a snow blower, yard tools, bicycles, yard toys, and an assortment of odds and ends, finding space to park even one of the cars has become a real challenge. Short of expanding our garage, what can you recommend? I agree, a garage expansion probably wouldn't help—not for long any way. Chances are, any additional garage space would be quickly consumed by even more stuff. A more promising and less expensive solution may be a separate and dedicated storage building just for your things. My suggestion would be to keep the garage for the cars (both of them) and use your storage building for everything else. Here at Fox Country Sheds, we specialize in quality, handcrafted outdoor storage structures. In addition to custom storage sheds, we also design and build free-standing one–car and two–car garages, which are ideal for additional car storage or larger yard machinery. We are also a reseller of quality Amish–built gazebo, and playset structures. For close to two decades now, we've been assisting homeowners like you solve their storage issues by designing attractive yet functional, maintenance-free storage buildings specific to meet their needs and budget. Since sheds can be constructed to almost any size and designed to serve almost any purpose, I would suggest you give some thought as to what you'd like to house in this facility. Is it limited to just those things listed above in your question or are there other possible needs? The reason I ask this is because sheds don't have to be a single–purpose, singleentry, open–space, box–like structure if there are other needs. More and more homeowners are interested in using their sheds for multiple purposes and have asked us to customize the design to accommodate those interests. Some homeowners with swimming pools, for example, have asked us to design a structure with a separate storage shed on one end, and a shady gazebo or porch on the other end. This type of "pool house" building is ideal for safe storage of pool chemicals and equipment, or even a private dressing room, while providing an attractive shady area on the porch for entertaining. Depending on what you plan to use your shed for, will dictate a number of things beyond its size. How many doors will be required and what types of doors (single, double, overhead)? Will you need ramps leading up to those doors? The number of windows and placement of such? Will you need a loft for additional storage? How about a workbench for tinkering? Does the structure need to be pre–wired for electricity? Do you want a covered porch or extended overhangs for weather protection? As for the aesthetics, you can specify wood or vinyl siding. Both options are available in the most popular residential colors to best complement your home. For a more custom look, some shed designs offer a stone-front option or have a mix of both vinyl siding and wood trim. A variety of roof shingles, window and door options––as well as accent pieces such as shutters, trim, flower boxes, cupolas and weather vanes––allow you to further customize your outbuilding to suit your taste and style. If all this sounds overwhelming, don't let it interfere with your decision to take control of your garage or storage needs. We can help you throughout the process. We are a family–owned business and we take great pride in helping our clients through the process of ordering, customizing, and delivering a product that will fulfill their needs while enhancing their property. Our sheds are delivered assembled via a shed trailer and placed right on your prepared site. We even have a crew that can prepare the site for you, or we can give you instructions on how to do it yourself. For property with limited access, we offer mule delivery or shed kits which can be assembled onsite. For more information please give us a call or stop by to see our display inventory. You can also visit us online at www.FoxSheds.com where you can customize and order your shed, garage, gazebo or playset. Either way, our friendly staff will be happy to assist you in solving your storage needs within a budget you can afford. Three years ago we had a beautiful deck installed off our kitchen/dining area. While the deck turned out absolutely gorgeous, I'm embarrassed to admit that we hardly ever use it. Why...you ask? It's the heat! With the intense sun on that side of the house, it's almost always too hot to use. We can't even enjoy the beauty of the deck from inside the house as we have to keep the curtains on the French doors closed to keep out the heat. This starts off in the spring and extends well into the fall months! Any suggestions? Answer provided by: Les Kreider, President–Owner, Kreider's Canvas Service, Inc. Your situation is not at all unique...in fact, we addressed a similar problem a few years back in this same column. What we said then still applies today, so here's a recap of our earlier response. Too many, however, rush into a possible solution to a problem without considering all the options and the advantages each solution offers. Each "possible solution" also can have a negative side, which often isn't discovered until the installed "solution" is completed. Then it is too late or too expensive to change. We like to look at as many options that are available and provide honest "green" solutions. One of our favorite "green" solutions is a type of sun protection called an awning. The cover either rolls up or is removable for increased "over winter" solar gain. Some numbers that I have actually observed is a deck surface's temperature drop of over 50 degrees. That occurred on a deck where we were installing a stationary frame canvas cover over one half the total deck surface. It was an 87 degree (air temperature) day so I measured a hidden deck surface that hadn't been exposed to the summer sun. It measured 87 degrees. I then pointed my digital thermometer on a fully exposed deck area. It was about 11 AM and the temperature read 139 degrees. A 50+ degree difference. This is the same difference we experience when a canvas cover is installed over an exposed deck surface. The surface is now shaded and you are able to walk on it in bare feet. Try walking on a 139 degree surface! An additional "cooling effect" is experienced on interior rooms that are connected to these covered deck areas. A few years ago in the month of August, we installed another canvas awning over a west facing deck. Our customer thought it was a "sales pitch" when I stated that the attached interior family room's temperature will drop 15 to 20 degrees. To her surprise it really did!!!! Our customer found their air conditioner was now running less while keeping the family room cool. Less run time, less electric, and less energy used, lowering their overall summer electric bill. In fact, a study done by the University of Minnesota found that air conditioning costs could be lowered up to 30% with a properly installed awning. You have to remember that when the awning is removed over winter, the reverse effect happens. The greenhouse effect sets in and provides solar gain and heat to those areas previously cooled by a canvas awning. Talk about having your cake and eating it too! Awnings provide a tremendous green effect and energy savings. Proper installation of a correct type of awning, along with a good, durable fit is also important. A properly installed awning can be used for 12 to 14 years. We have had several last over 20 years. The synthetic fabric of choice is Sunbrella due to the fact that it now comes with a 10–year warranty. It is our preference due to its fade and "rot" resistance. There are other green and energy efficient solutions, but we have found an awning to provide a great option to environmental concerns. A proper choice of style and construction details is very critical to a long lasting solution. We analyze your area. We then make a recommendation based on our 80+ years of combined awning experience. We also manufacture (some styles), install, and service your awning needs. Our goal is to provide you with a durable and great solution to your energy problem area. We don't create another problem with a hasty solution. We aim to please and we give free estimates. Give us a call at 717.656.7387 for our solution suggestions to your problem area. We don't pressure a sale. We like to discuss your options for an area and provide you with a great solution. 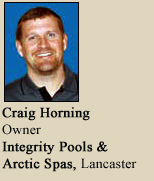 We recently visited Integrity Pools & Spas in Lancaster and noted that they only carry one brand of spas–Arctic Spas. Why is that and what else can you tell us about Arctic Spas? Answer provided by: Craig Horning, President, Integrity Pools & Spas, Inc.
At Integrity Pools & Spas, we support Arctic Spas because of their loyalty and their customer service to their dealers. We are proud of the craftsmanship of the product and the serviceability and longevity of the spas. Arctic Spas are a quality–made hot tub and we stand behind them with integrity. From a consumer's point of view, here are some things that should be important for you to know about Arctic Spas. Energy–Efficiency. Arctic Spas insulate using perimeter insulation–they are not full–foam! They insulate the cabinet walls, lip underside and floors with a high density polyurethane foam. This foam is added to a thickness that stops heat loss. The equipment is then placed inside of this cocoon, creating the perfect environment to capture the heat from the pumps and motors. Ambient heat from the pump penetrates the spa shell and helps to keep the water hot. This allows for an extremely efficient design and dramatically reduces running costs. Heat rises, right? So another part of this equation is our Mylovac cover. This cover is 5", the thickest and strongest cover in the industry and reduces your electric cost by more than a 1/3 compared to the industry standard! Serviceability. All Arctic Spas come with insulated, removable access panels on all sides of the spa. Many spa manufacturers bury potential problems completely in foam. This makes servicing the spa very difficult when foam needs to be chipped out to perform the services and then more added after the service. Servicing an Arctic Spa is simple; remove a panel, perform the repair and replace the panel. Arctic Spas provides an easy and efficient way to deal serviceability. No Need for a Concrete Pad. All Arctic Spas that we sell come standard with the Forever Floor–which eliminates the need to construct a concrete pad. This floor is composed of SMC fiberglass composites that make it impervious to moisture, pests and time. It is the same material the U.S. Military uses on the bottom of their Hummers. It's so strong that it completely eliminates the need for a foundation such as concrete pads, decking or blocks! Installation has never been easier and your spa floor will last forever. Arctic Spas Shells–Legendary Strong! Roughly 98% of all spa manufacturers use acrylic to form the shells of their spas. The acrylic is formed into a seating pattern and then insulation is blown around the spa to give the spa strength. If repairs are needed, that insulation needs to be chipped out in order to find the location of the leak. ARCTIC SPAS vacform their shells and then apply layer after layer of a proprietary filler–free fiberglass composite material to give the shell its legendary strength. Arctic applies more fiberglass than anyone else in the business; no plastic backing, no props or supports, and no foam is ever applied to the shell. Ongoing Maintenance–Spa Boy Takes Out the Guesswork. Arctic Spas has a unique feature–Spa Boy– which is an automated, low chemical, saltwater sanitation water care system for your spa. Used in conjunction with an ORP probe; you can now monitor your water from your smart phone to ensure your water will be crystal clear every day from the comfort of your own home, or from anywhere in the world so long as you have an internet connection! We use science to perform the menial tasks that have generally been associated with spa maintenance. Finally, your Arctic Spa can be almost MAINTENANCE FREE! Take the guesswork out of spa maintenance with Spa Boy, only by Arctic Spas! In closing, let me just say that there's a reason why hot tubs are immensely popular at winter resorts all over the world. Put some fun in your winter– without leaving home! For more information please don't hesitate to give us a call at 393.1600. Or, if you are planning to visit the BIA Spring Home Show at Spooky Nook, you can find us in booth 515. As new grandparents (with hope of many more), we like the idea of installing a swimming pool to encourage a lot of visiting in the years to come. Having never had a pool before, what are the things we should consider? First off, congratulations on your new family addition! Believe it or not, many of our first time clients are very similar to you. They are pool shopping for the same reason—an attraction for the grandkids—and because they have never shopped for a pool before, they are looking for information — all kinds of information! Since your question is general in nature, I've compiled a list of questions that we typically get from clients like you. I hope you find this helpful. Which is a better option, all–weather pool vs. a concrete pool? It really comes down to how you plan to use the pool. If you plan to use your pool year round; would like a full body massage; or quickly heat a small area of water; then a swim spa is the best option. Concrete options are a great choice if you are looking to have a more traditional pool environment and experience. Your swim season will be limited to approximately six months with a traditional concrete pool. How many months a year will my pool be open? Many of our customers open in April and close in October. Some customers even push closing farther into the fall, but it really depends on your specific situation. Things to consider when determining how long you may use the pool are your tree and landscaping environment; is there a spa being incorporated into the design; and will there be an outdoor living area in additional to the pool? These and many more factors all play a role in how long you may enjoy your pool season. How much will my electric bill be affected with having a pool? We use energy efficient pool pumps and equipment and while there will be some impact on the bill you should not see a huge increase in your electric bill during pool usage months. However, if your home becomes the focus of the neighborhood social circle, we can't say the same about your grocery and beverage bills. Does a salt pool really mean you are swimming in a salt pool (like the ocean)? No. It is actually a system of dissolved salt through electrolysis. Sanitation of the pool water actually happens with a chlorine generator. IntelliChlor uses common table salt to produce all the chlorine a pool needs, safely, effectively, and automatically. Same sanitation performance as manual chlorine addition without the drawbacks. No need for customers to buy, transport and store chlorine compounds. Will my homeowner's insurance increase? Pools are typically covered by most homeowner's insurance policies. It is recommended you check with your insurance professional to make sure you have the right amount and protection in place. How long should I plan for my backyard project? This depends on the size and complexity of the project. An all–weather pool or hot tub addition to your backyard can be up and running for your use in as little as a few days to a few weeks depending on tub selection and availability. A concrete pool requiring design and excavation can typically last three to six months, depending on design, permits, schedules and additional outdoor living area options. Please take all this into consideration when planning your backyard addition. Schedules fill up quickly when warm weather begins so planning early is always best! Again, I'm hopeful that this information proves helpful. If you have any other questions or would like additional information, I encourage you to give us a call at 393.1600. We would like to have some outdoor living space designed and installed for next summer. When should I contact a contractor and how do I choose a reputable one? When to start. As for when, the time is now! The earlier in winter, the better. For most hardscape contractors in this area, winter is our slow season due to the cold temperatures. While the weather keeps us mostly indoors, the winter season is ideal for getting your project discussed, designed, approved, and scheduled. These are all very important steps that should be taken BEFORE the nice weather returns. Once things warm up, the contractors will be extremely busy doing installations on those projects that were already on the books. Designing your project. There are a number of ways to get a design that you'll love and enjoy for years. If you have an imagination and are creative, you can design your outdoor space yourself. Another option is hiring a landscape architect to give you ideas and produce a drawing for the contractor to follow. In our case, we offer free design consultation and free quotes for the finished product. And to give you a better perspective of the proposed size and layout, we also paint the design on the ground before we begin any digging. If your project includes landscaping in addition to hardscaping, we team with a very reputable nursery who will do the entire landscape design including the plant selection, if requested. Choosing a contractor. Fundamental in your initial screening process—make sure the contractor is licensed and insured. Those that are not should be disqualified immediately. Does the contractor have photos of past jobs and references? While I wouldn't necessarily disqualify a new start-up company that doesn't yet have a portfolio of completed jobs or past clients to talk to, you'll want to do your due diligence in assessing their qualifications by examining their actual hardscape experience. Are they knowledgeable of industry construction standards and do they have a well trained crew? What industry certifications have they and their crew obtained? Do they have experience in the permit process and obtaining the necessary Township approvals? Larger projects sometimes require storm water management plans which add a level of complexity to the project, not to mention, additional time in the planning and approval stages. Once those fundamentals are out of the way, make sure that your prospective contractor inspires trust—one who listens to your ideas and asks questions rather than just telling you what he thinks would work. A big plus, at least in my thinking, is selecting a contractor whose designer is actually on the jobsite throughout installation. In our case, I'm that person. In fact, I'm also the man you'll see when you call for a quote. Having me onsite during construction helps to prevent any confusion as I know exactly what the homeowners approved and how things should look. And because I know exactly what needs to be done and actively participate in the work along with my crew, things tend to go smoothly and without delays trying to interpret a plan designed by someone else. Should you have any questions, please give me a call at 717.687.6897. And remember, don't wait for the nice weather to start thinking about your project—the time is now! My wife and I are looking for suggestions to make our patio roof area more useful. We have a great roof covered area with an outdoor kitchen, but during the extreme temperature changes, we often can't use it because it is too cool or windy to use for family gatherings. Also we don't like the feel of fixed walls with windows or screens because we want an open feeling especially in the warmer summer months. Do you have any ideas? Good question. There are several possibilities. The best solutions depends on the style of your existing structure. A solution used on new construction designs often involve folding glass doors. With smooth and straight areas, this option works fine when a new structure is being built as changes are easier to design into the area while it's being constructed. Because your area is existing, there may be too many changes needed to achieve a tight and effective fit. All these changes add to your final cost. This folding door method is usually the most costly of the options. A better solution may be one of the next two solutions. These both involve flexible curtains using two different opening methods. The midpriced method uses remote controlled motor driven roll up screens/curtains which are easily lowered by pushing a button. These curtains are available with solid fabrics (vinyl or woven) and not just screens. When ordering you can add optional clear vinyl window inserts which will allow light to enter your enclosed area on darker winter months. This creates a "window in a wall effect" and gives the area an enclosed room feel. You have an enclosed area with walls when you want it, but—at a push of a button—you can still walk into your yard or pool area. This roll up curtain is the easiest to use after the initial install but usually less costly than the folding door solution. The only down side (other than high cost) is that power curtains aren't usable in all enclosure situations because of the architecturally irregular surfaces of some support columns and top mounting surfaces. This leads to the lower costing rope and pulley curtain method. The lower costing rope and pulley roll up method often can be used to protect areas where neither of the two previous methods will work. It sounds odd but often works better than either of the other solutions when combined with zippers. The key is to properly construct and design the fit. Too loose fitting and the winds will destroy it. If the window panels aren't positioned properly, the ropes will scuff the clear vinyl when rolling up the curtain. Some areas have irregular walls and need fittings and extreme customization. Zippered panels help with this weather sealing. A solid fabric curtain using vinyl will provide a lower costing and "easier to clean" surface, while a woven fabric will provide a softer, less commercial feeling enclosure. The woven fabric of choice is Sunbrella which is a solution dyes acrylic with excellent sun fade resistance and mildew resistance. Optional clear windows can be used with either material. In summary there are several methods to enclose an outdoor area to make it become more useful. The best solution varies from area to area depending on the structural design where it is used. There isn't a one solution fits all method. Each area needs evaluated and options ranked according to usefulness. Should you have any questions or would like more information, give us a call or visit us online. We would be happy to hear from you. Exterior lighting has become increasingly popular with homeowners who are looking to illuminate their outdoor space for nighttime entertaining. Can you offer some ideas and tips on creating an eye-catching outdoor lighting plan? Many times, your landscape lighting is dependent on the natural and man-made structures that surround your home's exterior. For example, up-lighting trees and bushes creates a dramatic look and highlights the natural beauty of your yard or garden. Consider "moonlighting" trees by placing lights high in trees to give the effect of natural moonlight. If you have an outdoor deck or patio, lighting should include dimmer switches to help you achieve the desired effect. Turn up the brightness for added security when you're away from home and turn lights down to soften the mood when entertaining guests. Exterior lighting is not just about how and where you place the lights, but what type of light you use. What are some of the trends in bulbs used in outdoor lighting? There are several types of bulbs that are popular in exterior lighting. Moon lights or cool lights appear bluer than traditional lighting and cast a serene, luminescent glow. Candlelight is at the other end of the spectrum and provides an intense, but pleasing glow to outdoor tables, gazebos or pergolas. Another trend in exterior lighting is to "mix it up" by combining different types of fixtures into one lighting scheme. When lighting a walking path, consider varying fixture styles to create visual interest while reducing the risk of subtle imperfections when all lights are the same. Landscape lighting offers additional beauty and security to my home, but I'm concerned how the additional lighting will affect my electric bill. Can you recommend lighting options with minimal energy output? Today's exterior lighting offers a widerange of energy efficient options. In terms of cost, longevity and efficiency, fluorescents outperform low-voltage halogens Invest in low–voltage halogens or fluorescent bulbs that are dimmable, which can extend their lifespan. While the halogens bright, directionally focused light is ideal for illuminating specific areas of your landscape, LED and compact fluorescent bulbs are safer, cooler and cheaper to operate than low–voltage halogens. The average halogen is four times hotter than the average LED light bulb, which should be taken into consideration depending how close the lights are placed to flammable objects. When planning an outdoor lighting scheme, we recommend consulting with an electrician or a Yale lighting expert who can help you develop a plan that meets both your expectations and budget. For a huge selection of outdoor lighting fixtures, lampposts, landscape lighting and more, visit your local Yale Lighting Concepts & Design showroom, log onto www.yalelightingconcepts.com or simply call 1-877-336-0342 today to speak with a lighting consultant. We installed a paver patio area two years ago and never realized how hot this area can be. For some reason the area is always too hot or it rains when we have family or friends over in the afternoon or evening. We really need a little more guaranteed use of the area when we need to use it. What are some options for protecting that area? Answer provided by:Les Kreider, President-Owner, Kreider's Canvas Service, Inc.
First of all I want to encourage you to think through all your options. Each area is different not only in shape but in direction and exposure. Too many people rush into a solution without taking time to process all the options. Every alternative has both positive advantages and negative drawbacks. Consider what problem you need most important to solve. What are some questions I need to ask to arrive at the best solution? How exposed or protected is your area? Are trees or buildings close by and would they help shield your area from the sun or wind? Which direction is west? West is normally the direction prevailing winds and storms come from. Is the area close or attached to the house for an easy entrance and exit? Probably the most important question is how important is shade and rain protection to your lifestyle? Do you have many outside parties using a pool or outside kitchen area? What are several choices for protection over our area? Pergolas, Retractable Awnings, and Stationary Frame Canopies are most commonly used. Pergola. Pergola offers a great visual finish to your area but is least effective in shade and rain protection. Even the optional folding shade roof systems are very challenged to meet rainy weather. The fabric often used in these add on units is Sunbrella fabric which is an excellent synthetic fabric. However the fabric also needs a tight fit and good slope to give the best longevity. Initially the cover will repel water but after several years water pools and drips thru the woven fabric leaving a person sitting in the rain as the only option. We receive calls weekly about additional rain protection on pergolas. The best solution is to discuss weather protection expectations before deciding with this option. Often people don't give enough emphasis on the rain/shade factor until it is too late. Soft cushioned furniture is in big demand now, so rain protection may be more of an issue that needs factored into your decision than you may have originally thought. Retractable Awning. Another common quickly used decision is a retractable awning. Push a button and you get instant shade. One item that is often avoided intentionally in this discussion is the wind and rain factor. The wind is a problem that even the wind and rain sensors can't solve. Until the sensor decides it is unsafe for the awning to be open it may be too late. The physical design of a retractable is a roller tube on the top, with a bar on the lower edge (about 10' - 14' away) held in place by at least two spring loaded arms. On sunny wind free days you do have that choice of shade and sun but often entertaining doesn't happen only on those sunny and rain free days. With this option you haven't solved a problem, just changed it, with the same uncertainty factor of no guaranteed rain protection. Stationary Frame Canopy. Another solution we have found often overlooked is a stationary frame canopy where the cover is installed in the spring and removed in the fall for maximum sun and light into your house interior. This type of solution isn't your grandparent's awning from the 50's and 60's that wasn't durable or very easy to install and remove. Today most of the fabrics are solution dyed acrylics that have a soft canvas look along with a limited 10 year warranty. Back 30 years ago there was only a 3 to 5 year warranty and extreme fading occurred in as little as 2 years. The attachment methods used today allow for about a one third lower time to install and remove. The main factor in lowering the time for installation and removal of the cover is the Velcro rafter covers. Surprisingly Velcro properly installed works very well and doesn't loosen like the canopies bought in a cardboard box. Properly constructed, this solution can work very well in rainy and windy weather. A strong frame and tight cover fit is very important for a 12 year to 20 year canvas cover life. In conclusion, when the best solution for your area is being considered also calculate the total costs involved. Some choices may seem lower initially but till you add items to get the shade you need or the rain protection you want for your area, the cost of the protection may get rather expensive. Above all take time to think and process your options. Any of these options aren't low cost but selecting the best one will provide you with great satisfaction and use when the sun shines and the wind blows. We are available to discuss your area. We don't pressure a sale but want to offer you the best solution for your area based on our 49+ years of awning experience. Should you have any questions or would like more information, we'd be happy to hear from you. Give us a call or visit us online. We would like to add the warm glow of fire to our outdoor living space. Which is better, a fireplace or a fire pit? Do we have to use wood? Are there other ways to add fire to our outdoor space? Fire has definitely become a popular addition to outdoor living spaces. With so much demand the number of options has grown significantly over the years. People tend to gravitate towards fire so a fireplace or fire pit becomes the perfect place to gather with friends and families. Fire can also be used in other ways to accent and add interest to the landscape. The decision between a fireplace or fire pit can come down to several factors. The biggest deciding factor can be cost. On average fireplaces tend to cost more, sometimes significantly, than a fire pit. How the space is to be used or how you wish to gather around the fire can also influence your decision. Fireplaces create a focal point in front of which most people arrange a sitting or dining area. Fire pits are usually visible from all sides allowing for a more casual interactive experience, much like having a campfire right in your backyard. If creating a strong architectural focal point to your outdoor space that provides ambiance and atmosphere is what you're looking for then a fireplace is the perfect choice. If having conversations gathered around the campfire and roasting marshmallows is what you enjoy then a fire pit is more your style. Fire pits can be constructed as a permanent feature however if space is limited a portable fire pit can be a convenient alternative. A portable fire pit allows the flexibility of having a gathering around the fire but if the space is needed for another purpose it can be easily moved. With the popularity of portable fire pits there is a vast range of styles and options available to suit almost any taste, style and budget. So to answer the question which is better, a fireplace or fire pit, it all depends on what works best for you. Along with the popularity of fireplaces and fire pits comes the need and desire for convenience. Wood is no longer the only choice of fuel. Natural gas and propane have become popular choices. While a wood fire does create a certain ambience and nostalgic feel many people are turned off by the constant need to store firewood and clean out ashes, not to mention the smoke they produce. The alternative is to install a natural gas or propane fireplace or fire pit. Due to their popularity manufacturers are continually improving their outdoor fire features and introducing new styles to the market. While wood remains a popular choice to many people the convenience of flipping a switch and having an instant fire far outweighs the joy of hearing the crackling of real wood fire. With ever increasing popularity of outdoor living and desire of homeowners to add new and interesting elements to their outdoor space the use of fire in other applications besides fireplaces and fire pits has grown. Fire bowls are a bold way to add the warm glow of a fire to an outdoor space. Usually placed on pedestals or paired with water, especially swimming pools, fire bowls can produce a striking effect. Gas powered torches and lanterns also add the warm glow of fire but in a more compact form. These features make a stylish alternative or addition to outdoor lighting. Another unique fire feature is one that is completely out of sight until turned on. Usually placed at ground level, the burner is buried beneath a bed of gravel or other noncombustible material and when turned on the flames appear to be emanating from the ground. Other choices include fire tables, basically a dining table with a central fire element, and fountains with fire. The choices and styles are almost endless. There is no doubt fire can add warmth and ambience to a living space. Gathering around a fire is a wonderful way to bring friends and family together. With the ever increasing popularity of outdoor living adding fire is an ideal element to add to an outdoor space. A fireplace or fire pit can also extend the use of your outdoor space earlier and later into the season. Entertaining around a fire is a wonderful way to spend a cool autumn evening. With fire being only one part of the overall outdoor experience landscape designers and contractors are an ideal place to start when considering adding a fire feature. They can design and build the entire outdoor environment and design in the fire element as part of the overall vision. With so many options, styles, and applications available there are countless ways to add fire to your outdoor space. We just purchased a home that has a beautiful wooden deck. Based on its condition, it appears the deck is fairly new. What should we be doing to preserve its beauty? Wood decks are a favorite gathering place for family and friends year round. That's why it's very important that we take the time to protect them from the elements and ensure that everything is safe and sound. With just a little bit of planning and routine maintenance, you'll be able to enjoy your deck for many long years. To answer your question thoroughly, I'd like to address several issues that may be helpful. Why should I stain my deck? Wood stains are the best way to protect your deck from the elements and the general wear and tear of tables, chairs and foot traffic. Staining can also bring out the natural beauty of real wood. What are the different stain options? There are three basic stain options— clear, semi–transparent and solid. Each option will give you a different look depending on how you apply it and how long it is between recoats. Clear stains will have some water repellent properties but very little color. If your deck is in a sunny area clear stains may need to be reapplied on an annual basis. Semi–transparent stains add color and protection while still allowing the grain and natural beauty of the wood to show through. Depending on the amount of direct sunlight and wear, semi–transparent stains should last several years. Solid color stains will look much like a painted surface with almost none of the wood grain showing through. A solid stain will provide the longest time between recoats. A general rule of thumb is the more solid in color a stain is the longer it will last. How do I know when it is time to restain? Visual wear and tear is the obvious indicator, but if you're unsure try the water test. If a drop of water soaks into the wood rather than beading up like a waxed car, it is time to restain. What prep work do I need to do? First you should clean the deck surface with a pressure washer and deck cleaner to remove dirt, mildew and any loose material. Be careful not to damage the surface of the wood. If applying semi–transparent or clear stain, it is recommended that you sand the surface with the grain to achieve a uniform look. Allow all surfaces to dry thoroughly before applying a stain, usually 24 to 48 hours is sufficient, but be sure to read the label on your stain. You can test the wood surface using a moisture meter. New pressure treated wood can be stained as soon as the moisture content is less than 18%. Should I use a professional painter? If you have experience painting and don't shy away from do–it–yourself projects there's no reason why you can't stain your own deck. However, for those with very large, very dirty or multi–tiered decks it may be worth hiring a professional. Professional painters have all the proper tools for cleaning and applying stains. They can help select the proper stain and color for your deck. And they have the experience and knowledge to protect your property and the environment from potential hazards involved with cleaning and staining a deck. What other things should I know before staining a deck? There's no justification for using anything but high quality products. It takes the same amount or less time to apply a better product and it will last longer. Check the weather forecast prior to staining your deck. Avoid applying stain in the direct sunlight or just before a rainstorm. Apply stain when surface and air temperatures are between 50 and 80 degrees. To speed up the process, use a paint roller to apply the product and follow directly with a wide brush to work it into the cracks. Always back brush in the direction of the grain to eliminate lap marks. Use only one coat of a clear or semitransparent stain. Solid color stains may require two coats. For more information, I encourage you to stop by one of our two convenient showroom locations and let experience and personal customer service work for you! Why can't I get decorative or custom pool fencing from my builder? First of all, you can get custom pool fencing. However, most builders only put in a build budget for mass production economy pool fencing because almost the only pool fencing available to fencing contractors and builders are a high production, thin wall aluminum pool fence. Because it's such a competitive market, the production fences have to be designed for quick assembly and mass production. This is why you don't see very decorative or very durable pool fences in the builders market. Almost all of these production fences have some kind of "Limited Lifetime Warranty" on them, with limited being the key word here. There is good production fencing out there and then there is some really low quality fencing that shouldn't be on the market in my opinion. One of the largest fence producers in the nation has one of the worst fences. In salt spray tests, the fence simply corrodes very quickly, which means it has a poor coating on top of being built with almost paper thin aluminum tubing. We got a call one day from a day care facility. They needed us to repair or reinforce a fence. The eight–year olds were grabbing the pickets and bending them back and forth until the screws broke and they pulled them right out of the fence. That's the ultimate definition of cheap fencing. We do get requests for custom decorative pool fencing. The other day I took a phone call from Florida requesting a price on 400 feet of solid aluminum forged and welded fencing with a distinct old world look. These are the kinds of projects that will be around hundreds or thousands of years from now if properly maintained. Should you have any questions regarding fencing, gates, railings or any other metal fabrication application, please do not hesitate to give us a call at 717.397.9500 or visit our website www.ShrockFab.com. Part of my landscaping renovation plan is to include exterior lighting for both functional and aesthetic purposes. What advice can you give me? Landscape lighting is a wonderful way to add both beauty and security to your home. Today there are countless ways to illuminate the exterior of your house — from spot lighting to accent lights to flood lighting. Before embarking on your outdoor design project, here are a few considerations to ensure your landscape lighting will shine brightly for years to come. What are some of the latest trends in landscape lighting? Today's homeowners are taking landscape lighting to a whole new level and treating it as an art — creating a picture of their home's exterior at night. Keep in mind there are three main types of lighting — ambient, task and accent. Ambient provides overall lighting for your home. Task lighting is also functional, but it plays a specific role such as helping you cook, read, etc. Accent lighting is used strictly for decorative purposes. Outdoor lighting can include all three types. Use accent lighting to key in on your home's best features such as a tree or bush, archway, wall, fence, pool or pond. Task lighting can be installed near a barbecue grill or a basketball net to extend outdoor activities into the evening hours. Motion detectors can light up obscure spots when someone passes by. Photocells automatically turn on fixtures at dusk and off at dawn, providing protection even when you're away from home. Ambient lighting can be installed under handrails, stairs and bench seating on decks to help lighten your outdoor entertaining. Illuminated steps, paths and driveways help prevent after–dark accidents. The key to attractive outdoor lighting is to follow a less–is–more philosophy. Soft, natural light should mimic moonlight on the property. You should see the landscape, not the fixture so the outdoor lighting tells a visual story. What type of lighting is best for the outdoors? There are three kinds of energy-efficient bulbs to choose from: halogen incandescent, compact fluorescent lamp (CFL) and light-emitting diode (LED). All three bulbs are more energy efficient than the traditional incandescent bulb, but provide different effects on your outdoor lighting. Halogen incandescent light bulbs emit the familiar warm-toned incandescent light and works perfectly with dimmers and other lighting controls. Compact fluorescent lamps (CFLs) are simply curly versions of the long tube fluorescent lights you may already have in your kitchen or garage. The light emitting diode (LED) is one of today's most energy-efficient bulbs and can last up to 25 times longer than traditional incandescent bulbs. While LEDs are often more expensive, they still save money because they last a long time and use a low amount of energy. While the halogens bright, directionally focused light is ideal for illuminating specific areas of your landscape, LED and compact fluorescent bulbs are safer, cooler and cheaper to operate than low-voltage halogens. The average halogen is four times hotter than the average LED light bulb, which should be taken into consideration depending how close the lights are placed to flammable objects. How can I conserve energy with my landscape lighting? Just as you would invest in an appliance you expect to use for years, buying a light bulb now requires more of an initial investment but yields much greater returns in terms of energy savings and operating life. In terms of cost, longevity and energy efficiency, fluorescents outperform low-voltage halogens. Invest in lowvoltage halogens or fluorescent bulbs that are dimmable, which can extend their lifespan. weather–resistant products and new technology that are both attractive and functional. By following these simple guidelines, you can strike the right balance with a landscape lighting design that is beautiful, secure and eco–friendly. For a huge selection of outdoor lighting fixtures, lamp–posts, landscape lighting and more, visit your local Yale Lighting Concepts & Design showroom, log onto www.yalelightingconcepts. com or simply call 1–877–336–0342 today to speak with a lighting consultant. We have all heard of the term "Outdoor Living"; but, what exactly does it mean? Does it literally mean living outside? In a way, that is exactly what it means. There is an entire industry ($6.2 billion per year, in fact) dedicated to help you 'live'outdoors. Since early 2000, manufacturers and distributors have keenly developed an array of products and concepts to allow you, the homeowner (friends and family, as well), to enjoy and interact with your outdoor environment in new and exciting ways. Contractors and designers have collaborated in a seamless design/build process to implement outdoor living projects few people previously had the chance to enjoy. The "outdoor living" concept has evolved way beyond plastic lawn chairs, gazing globes and tiki-torches. Any room in your home can be blended artistically into your landscape with the aid of your vision plus a designer's guiding hand. Plants and trees, waterfalls and fire pits, outdoor kitchens, living & dining rooms, even family rooms are all within the scope of possibilities. But, why? Live outside, that's crazy talk! We have spent centuries perfecting how to live comfortably confined indoors; why go back in time? Ah, a very valid question, which begs us all to go back to our carefree days of childhood. Do you recall a time the outdoors made an indelible memory? Really, take a minute and think about it. Now what does your childhood memories have to do with outdoor living? Well, childhood is (or at least should be) an escape from reality, Peter Pan so–to–speak. In a land of make–believe and wonder there are no ringing phones, chirping text messages or looming deadlines. There is no tension, stress or turmoil–only hopeful dreams and imaginations. As adults, we all tend to be overwhelmed with everything – our day–to–day life consumes us. We have forgotten how to be like a child. We can't escape everyday stresses and strains. We have forgotten how to intimately interact with our environment like children. We have become responsible. And that's where outdoor living could and should play a part in our daily lives. Ok, I know some of you are saying I am a bit left–of–center. But hear me out; if you embrace it, the concept of outdoor living allows the stress of the day to be forgotten for a time. Blur the lines between indoors and outdoors. Consciously decide your home and outdoor environment is a stress–free zone. As proof of my premise, a fairly recent movie release, The Hobbit, did very well at the box office. We as an entertainment starved society desire to escape reality, just for a bit of time. I did not see the movie (nor plan to), but I did reread JRR Rings trilogy known as There and Back Again. While reading Tolkien's skillfully written prequel, I imagined how fanciful worlds inhabited by no nonsense Hobbits and others of the fairy tale ilk can help transform our attitude and outlook towards outdoor environments – deem them either stress–free zones or places of adventure and mystery. I know, you are probably questioning my bearings and perhaps my sanity. But bear with me for a moment. You see, in the very beginning of Tolkien's novel you get the sense of a Hobbit's overall take on life. In a brief encounter with the wizard, Gandalf, Bilbo Baggins, the Hobbit, says "'Good morning!' and he meant it. The sun was shining, and the grass was very green. 'A very fine morning to be out of doors in the bargain. Sit down. There's no hurry about us, we have all the day before us!'" You see, Bilbo had just the relaxed attitude I am talking about! As a whole, Hobbits are not to be hurried creatures. Unfortunately for Bilbo, Gandalf surreptitiously lures him away from his comfortable hobbit hole into an epic treasure seeking adventure. To find out about Bilbo's adventures, you'll have to read the book(s), which I highly recommend. For you and me here in Realityville, we're talking about declaring your home and landscape a stress–free zone. Take the advice of a hobbit, don't be in a rush–have your morning coffee on the patio, enjoy the sunshine on your face. Or, if you desire adventure, like Gandalf, drama and adventure can be designed into your landscape as well. Through the use of all your senses (and imagination), your home and landscape can become a relaxing escape or an epic adventure depending on your attitude and mood. Your escape is as individualized as you–and not far from your back door! But, perhaps you just can't imagine what is possible–those carefree childhood days are recessed under layers and layers of responsibility. Well, we can sit down together and peel those layers away revealing what actually awaits you in your outdoor environment. Now, if you decide to read the Hobbit, do so outside reclined in a comfortable chaise lounge, preferably with a light breeze blowing nature's scent around while birds sing lullabies orchestrating scenes of peace and serenity. But, watch out, childlike adventure may lurk just beyond the periphery of your imagination. This summer we are planning to have a patio built. 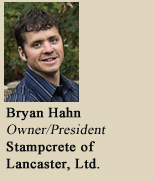 Considering all of the options that are out there, we are interested in composite pavers. Are they a good choice for a patio and what can you tell us about them? Answer provided by: The Sales Team, Musselman Lumber Inc.
You have made an excellent choice in what to use for your patio. AZEK VAST Pavers are composite pavers that are a great alternative to traditional pavers of concrete or clay. Unlike rubber pavers on the market, they are made up of 95% post-consumer recycled material giving them physical strength, durability, and the appearance of brick pavers. With the five different color choices (Redwood, Boardwalk, Olive, Waterwheel, and Village), you can create your ideal color pattern. The AZEK VAST Pavers are currently available in a 4" x 8" size in both a 1¾" and a 2¾" thickness (thickness includes the grid pad). Additional sizes and textures are being considered. Also, these pavers can be used for more than just patios. From walkways and entranceways, to residential driveways and even flat roofs, these pavers will bring a unique look and style to your outdoor project. With the 16" x 16" grid system for the pavers, installation time is reduced and ensures straight lines and a level layout. At about a third of the weight of concrete pavers, the composite pavers are easier to work with on the job. The site prep and sand/gravel base is the same process that you would normally use for masonry pavers. You can cut them with a standard mitre saw or jigsaw, avoiding having to rent masonry wet saws. If using the pavers over a waterproofed, structural flat roof surface you can still use the same grid system. A recent flat roof project by T.L. Smoker Construction in downtown Lancaster used a herringbone pattern with a running bond border in the Boardwalk and Redwood colors. The effect was extraordinary, as a plain rubber roof was turned into a beautiful outdoor gathering spot. The pavers have little maintenance other than the occasional replenishment of joint sand (polymeric sand is not recommended). They are highly stain resistant because they are non–porous and have low absorption properties. Any stains or chemical spills though should be cleaned and rinsed off as soon as you have the chance. Warranty is an important aspect to any product in your home improvement projects. AZEK VAST Pavers are backed by a 10–year limited warranty and lifetime warranty against cracking in residential applications. With spring here and summer fast approaching, I’ve decided that this is the year to finally act on my dreams of creating a beautiful and functional outdoor kitchen. Unfortunately, I’m not sure where to start. What can you tell me that will help me make good decisions now and avoid feelings of regret later? You are wise in your approach. Doing your homework and learning as much as you can will certainly help reduce your chances of doing something you'll end up regretting. Having been in the outdoor kitchen and patio business for many years now, here are some basic things to consider. Outdoor Kitchens–Overview. In the past when we thought about cooking outdoors our thoughts usually went to a portable gas or charcoal grill. As we spend more time entertaining at home, with our friends, we look for ways to make it easier. If we spend a lot of time running from the grill to the house for grilling needs we find ourselves spending less time with our guests, not to mention a lot of running back and forth. When we want to cook outdoors, eat outdoors, and entertain outdoors we find an outdoor kitchen to be the perfect solution. The Design Process. As you think of designing your outdoor kitchen, you will need to consider the existing space you have available, what type of cooking you wish to be doing and what type of appliances you need to make it the right setup for you. You will want to start with a decent grill—15–year warranty or better. Remember, this grill will be outdoors year round and you don't want to be replacing it every 5 years. Next consider what type of foods you will be cooking. Many people will have a gas grill and a Big Green Egg charcoal grill or a wood pellet grill for doing 8–12 hour slow cooked meats. You may also consider a Chicago wood burning brick oven for your breads, pizzas, and baking needs. To have your outdoor kitchen function the way it should, you will want to consider a refrigerator, a sink, a trash can, a warming drawer, cooler, doors and drawers for storage space. The options are many so you will want to visit a display room and get a good idea what is available to maximize your space. Key To Good Design. Just like an indoor space, where guests tend to congregate in the kitchen, it's important to create conversation areas near the chef. The key to a good outdoor kitchen design is to have clean up space and storage spaces to avoid numerous trips back and forth from outdoor to indoor kitchens. It's all about functionality. A well-designed outdoor kitchen will function just as well as an indoor kitchen, with the added benefit of unlimited space to accommodate large crowds. Custom Cabinets. Again, just like indoor kitchens, custom cabinetry can be designed to fit your space, whether it is an island or tucked in a corner of your deck or patio. Find a local company who designs and builds the cabinets themselves and you can have your own customized kitchen at about the same price that you would buy a standard manufactured one! A custom cabinet can be made to match the outside of your home or it can be a standalone masterpiece. Your countertop can be granite, marble, or real stone. In designing the outdoor kitchen/living space, called a Staycation, a homeowner should also think about exposure to the elements. "Do I need a pergola for shade, a fireplace or fire pit to extend the season in cooler months?" Plans should also consider the landscape; from the views guests see when they are dining to potential ingredients that could be planted close at hand for the chefs. Creating an outdoor living area Staycation helps homeowners make the most of the warmer months. For outdoor living, there's nothing like it. Costs. Depending on whether you buy appliances and whether you build your kitchen or have an expert build it for you will have a large impact on the price. A modest kitchen may start in the $10,000 range if you are willing to do some of the work yourself. Remember, this is an investment that will increase the value of your home. For more information, please give us a call at 717.442.8794 or better yet, come visit us in Gap and browse through our showroom for a first hand look at numerous (and beautiful) options. If you are free, we'd love to see you at our Open House on May 4th and 5th. As mentioned in our ad (below), visit www.pagrillcentral.com for details. Help, we feel trapped in our home! We have a gorgeous deck but can never use it because it is always too hot. Plus, we keep our blinds pulled tight to block the sun but we can still feel the heat coming through the windows. Is there a practical answer for our problem that will solve both issues at once? Answer provided by: Les Kreider, President–Owner Kreider's Canvas Service, Inc.
First of all, great question! Too many people rush into a possible solution to a problem area without considering all the options out there, and the advantages each solution offers. "It's hot and I want it solved instantly!" Each "possible solution" also can have a negative side, which often isn't discovered until the installed "solution" is completed. Then it is too late or too expensive to change. We like to look at as many options that are available and provide honest "green" solutions. One of our favorite "green" solutions is a type of sun protection called an awning. The cover either rolls up or is removable for increased "over winter" solar gain. Some numbers that I have actually observed is a deck surface's temperature drop of over 50 degrees. That occurred on a deck where we were installing a stationary frame canvas cover over one half the total deck surface. It was an 87 degree (air temperature) day so I measured a hidden deck surface that hadn't been exposed to the summer sun. It measured 87 degrees. I then pointed my digital thermometer on a fully exposed deck area. It was about 11 AM and the temperature read 139 degrees. A 50+ degree difference. This is the same difference we experience when a canvas cover is installed over an exposed deck surface. The surface is now shaded and you are able to walk on it in bare feet. Try walking on a 139 degree surface. An additional "cooling effect" is experienced on interior rooms that are connected to these covered deck areas. About 5 years ago IN THE MONTH OF AUGUST, we installed another canvas awning over a west facing deck. Our customer thought it was a "sales pitch" when I stated that the attached interior family room's temperature will drop 15 to 20 degrees. To her surprise it really did!!!! Our customer found their air conditioner was now running less while keeping the family room cool. Less run time, less electric, and less energy used, lowering their overall summer electric bill. In fact, a study done by the University of Minnesota found that air conditioning costs could be lowered up to 30% with a properly installed awning. You have to remember that when the awning is removed over winter, the reverse effect happens. The greenhouse effect sets in and provides solar gain and heat to those areas previously cooled by a canvas awning. Talk about having your cake and eating it too. Awnings provide a tremendous green effect and energy savings. Proper installation of a correct type of awning, along with a good, durable fit is also important. A properly installed awning can be used for 12 to 14 years. We have had several last over 20 years. The synthetic fabric of choice is Sunbrella due to the fact that it now comes with a 10 year warranty. It is our preference due to its fade and "rot" resistance. There are other green and energy efficient solutions, but we have found an awning to provide a great option to environmental concerns. A proper choice of style and construction details is very critical to a long lasting solution. We analyze your area. We then make a recommendation based on our 80+ years of combined awning experience. We also manufacture (some styles), install, and service your awning needs. Our goal is to provide you with a durable and great solution to your energy problem area. We don't create another problem with a hasty solution. We aim to please. Additionally we give free estimates and cover most of southeastern Pennsylvania, along with connecting parts of New Jersey and Delaware. Give us a call at 717.656.7387 for our solution suggestions to your problem area. We don't pressure a sale. We like to discuss your options for an area and provide you with a great solution. We hear a lot of talk about outdoor kitchens and living space and I’m definitely interested. I would like to do this right, so what can you tell me that would help in my planning? In the past when we thought about cooking outdoors our thoughts usually went to a portable gas or charcoal grill. As we spend more time at home, entertaining ourselves and our friends, we automatically look for ways to make it easier. If we spend a lot of time running from the grill to the house for grilling needs we find ourselves spending less time with our guests, not to mention a lot of running back and forth. When we want to cook outdoors, eat outdoors, entertain ourselves and our friends outdoors we find an outdoor kitchen to be the perfect solution. To help you think things through with your outdoor kitchen, let's go through the typical questions I get from homeowners. How do I start the designing process? As you think of designing your outdoor kitchen, you will need to consider the existing space you have available, what type of cooking you wish to be doing and what type of appliances do you need to make it the right setup for you. You will want to start with a decent grill such as one with a 15-year warranty or better. Remember, this grill will be outdoors year round and you don't want to be replacing it every 5 years. Next consider what type of foods you will be cooking. Many people will have a gas grill and a Big Green Egg charcoal grill or a wood pellet grill for those meats that require slow cooking on low heat. You may also consider a Chicago wood burning brick oven for your breads, pizzas, and baking needs. To have your outdoor kitchen function the way it should, you will want to consider a refrigerator, a sink, a trash can, a warming drawer, cooler combination, doors and drawers for storage space. What is the key to a good outdoor kitchen design? Just like an indoor space, where guests tend to congregate in the kitchen, it's important to create conversation areas near the chef. The key to a good outdoor kitchen design is to have clean-up space and storage spaces to avoid numerous trips back and forth from outdoor to indoor kitchens. It's all about functionality. A well designed outdoor kitchen will function just as well as an indoor kitchen, with the added benefit of unlimited space to accommodate large crowds. Can I have my kitchen cabinets custom designed or are there certain sizes I'm stuck with? Absolutely, design it to fit your space, whether it is an island or tucked in a corner of your deck or patio. Find a local company who designs and builds the cabinets themselves and you can have your own customized kitchen at about the same price that you would buy a standard manufactured one! A custom cabinet can be made to match the outside of your home or it can be a stand-alone masterpiece. Your countertop can be granite, marble, or manufactured concrete which has the appearance of marble at about 30% less cost. In designing the outdoor kitchen/ living space called a "Staycation" a homeowner should also think about exposure to the elements. "Do I need a pergola for shade, a fireplace or firepit to extend the season in cooler months". Plans should also consider the landscape; from the views guests see when they are dining to potential ingredients that could be planted close at hand for the chefs. Creating an outdoor living area staycation helps home owners make the most out of the warmer months. For outdoor living, there's nothing like it. What kind of cost am I looking at for an outdoor kitchen? Depending on whether you buy the appliances and build it yourself or have an expert build it for you will have a large impact on the price. I would say you could have a modest kitchen starting at $5,000.00 if you are willing to do some of the work yourself. For more information, don't hesitate to call me. I also invite you to come visit us and our recently renovated showroom and outdoor patio—complete with a full line of top quality outdoor kitchen products. As a homeowner, how can I minimize exterior lighting energy costs while maximizing curb appeal? And which lighting options provide the greatest payoff? Outdoor lighting brings an element of security, ambience and style to your home's exterior. With electricity costs on the rise, many home-owners are looking for ways to cut back on their energy consumption—indoors and out. Fortunately, today's ever-evolving lighting products and solutions allow you to maximize curb appeal AND energy savings. You can create a zen-like ambience with contemporary Asian lanterns or pay homage to a beloved tree with in-ground landscape lighting. Since energy-savers like CFLs are now designed for nearly every lighting application, the hardest part of creating an energy-efficient lighting plan will be deciding on a style. As for which provide the greatest payoff, for immediate savings with a minimal investment, swap your incandescent bulbs for fluorescent versions. Fluorescent and CFLs are four times more efficient than their incandescent counterparts and affordable for most homeowners. Fluorescent lighting has come a long way from its roots as the blue-whitetoned overhead lighting source used in schools and industrial settings. It's now available in warm, inviting shades, so there's no need to choose between form and function. One limitation of the CFL is that they don't offer optimal performance in extremely cold weather. Look for CFLs with a cold weather ballast for the best possible performance from your lamp when the weather dips below freezing. Another great and relatively easy way to cut back on your energy use is to install dimmers on your exterior lighting. By dimming a light source by 50%, you increase its life span 20 times and reduce energy consumption by 40%. Dimmers also provide an aesthetic advantage—allowing you to adjust your home's exterior lighting to your preference. If maximum savings and minimal maintenance top your list, you can't beat LEDs. Once primarily used in single-source applications like pens and electronics, LEDs are now emerging on the exterior lighting market. They're not only the longest lasting light sources available, but they also reduce energy usage by 90%—a huge savings over incandescent bulbs. LEDs are now available in path lights, accent lights, security lighting—you name it. They're more expensive than CFLs, but they offer an unsurpassed electricity savings and long life span. As LED technology advances, the cost for the consumer will decrease. If you're not ready to invest in LEDs, at a minimum, we recommend them for water applications and hard-to reach lighting. In a pond, LEDs offer superior protection against corrosion. And, if you're installing lights high in a tree, you'll be glad you won't have to replace your LED any time soon. For a huge selection of outdoor lighting fixtures, lamp-posts, landscape lighting and more, visit your local Yale Lighting Concepts & Design showroom, log onto www.yalelightingconcepts. com or simply call 1-877-336- 0342 today to speak with a lighting consultant. Please visit our web site for locations, driving directions, showroom hours and contact information. With spring quickly approaching, we are considering a landscape master plan and potential improvements to our outdoor living spaces. We realize we need to hire a professional, but we don't understand the process or what type of help we should be looking for — can you give us guidance on this? Here are some questions and answers that will help you gain a better understanding of landscape design and construction. What is the difference between landscape architect, landscape designer and landscape contractor? Most states require a landscape architect to pass a rigorous licensing exam and be registered with their state's Board of Landscape Architects. They have either (or both) an undergraduate or graduate degree in landscape architecture and have apprenticed with a licensed professional. Those who have not taken and passed the licensure examination may not use the title "landscape architect." A landscape designer, as opposed to a landscape architect, does not have any requirements — anyone can call themselves a landscape designer. That is not to say there are not talented and professional landscape designers. A landscape contractor is someone who installs the landscape based on plans from the landscape architect or designer. Sometimes the word "landscaper" is used for a contractor or someone who maintains the landscape. What types of services can landscape architects offer? This is a diverse and often misunderstood profession. Services range from concept sketches and hourly consults to master plans, construction drawings, bidding, tree tagging and supervision. Landscape architects help design all aspects of the built environment and are concerned with aesthetics as well as function — they lay out roads, buildings and parking lots, sidewalks, steps, water elements, planting and site furniture including lighting. Some landscape architects are involved solely in site engineering like storm water management. Why is a Master Plan so important? It is the 'big picture', a 'roadmap', and will save you heartache and money in the long run. No matter what size your property is, starting with a plan — a visual, two-dimensional long-term strategy for getting from point A to point B — is essential. It need not be detailed... it doesn't necessarily need specific plantings, materials or construction methods, but it should show areas and relationships, for example house to street, driveway to path, patio to lawn, and planting areas that define outdoor spaces. Because most people do not implement the entire plan all at once, the details are figured out later, when a particular phase of the plan is ready to be started. Master plans should be done in combination with sectional drawings or photographs. This helps in understanding the third dimension and allows the mind to better grasp what views may need to be screened, enhanced or framed, as well as more complicated grading issues signaling the need for retaining walls and steps. Some homeowners may be able to do this on their own, but often require assistance from a landscape architect, who can think more artistically and pull all the programmatic elements together — sometimes just having an objective, independent party will bring some unique and inventive ideas to the table. What will a Master Plan cost? The answer will depend on several things: the size of the property and time it will take for design and presentation, the involvement of the client and number of meetings required, and the ability of the client to visualize in plan view or their need for sketches and imagery to assist them. Some presentation techniques are quicker than others and may not need to be rendered in color, so that can reduce the time and ultimate cost of the plan. After the initial consultation and a better sense of what is required, a fee proposal can be developed. What season is the best time to begin the planning process? The myth is that I am less busy during the winter months. Often I will begin in the late fall for a project hoping to be installed in the spring. Projects requiring Township approvals can take even longer, so it's best not to wait! Hopefully this information is useful and puts you in a better position to proceed with your upcoming project. For more information, I encourage you to visit my web site at www.howardjaysupnik. com, or better yet, give me a call at 519.1554. How can ordinary table salt give your pool the same sanitization performance as chlorine, while eliminating odor, stinging eyes, irritated skin, and bleached-out swimsuits? Good old fashion ordinary table salt along with the new IntelliChlor Chlorine Generator is really all you need to maintain clear water both safely and effectively. Simply add salt to your pool water and let IntelliChlor work its magic. As the dissolved salt flows through the IntelliChlor generator cell it is converted to pure chlorine and is distributed throughout your pool. This process keeps your water fresh, clear, and safe. Unlike most conventional chlorine additives IntelliChlor continuously recycles the salt day after day. In addition to sparkling, clear water IntelliChlor makes monitoring chlorine as simple as can be with its built-in control and display panel. Just push a button to choose one of the five sanitization levels and IntelliChlor tells you exactly how to set it for proper chlorine output. IntelliChlor also provides you the same sanitization performance as chlorine, without disadvantages like odor, stinging eyes, irritated skin, or bleached-out swimsuits. IntelliChlor is not only simple, safe, and automatic, but a provider for perfect water and a worry-free environment. IntelliChlor can be used on pools up to 40,000 gallons with proper TDS. The cost of this stress-free device ranges roughly from $2,000 to $2,500 in cost. The payback is around 4 years. If an IntelliChlor Chlorine Generator interests you feel free to contact Integrity Pools and Arctic Spas at (717) 393-1600 or stop on by at 2106 Spring Valley Road Lancaster PA.
My husband and I thoroughly enjoy soaking in hot tubs and do so at every opportunity while visiting resorts. Although we would love to have one of our own, we’ve heard that they are a maintenance nightmare. Is spa maintenance really as time consuming and dreadful as we hear? In the early days (which really weren't that long ago), you would’ve been right about your maintenance concerns. Fortunately, the spa technology and additives have evolved to such a degree that I’m happy to report that nothing could be further from the truth. Hot tubs today require very little time and, for that matter, very little money to maintain. Today's spas are equipped with superior sanitation systems that allow the user to be confident every time they enter their spa. Among the sanitation system components that are used today are ozanators, which are highly effective bacteria killers. Ozanators produce ozone which produces oxygen 3 which kills bacteria. Unfortunately, ozanators alone will not completely sanitize your spa—assistance is needed from chlorine. Some manufacturers use a combination of sanitizing agents, which include the afore’ mentioned ozanator coupled with a product called Microban. Microban antimicrobial protection was developed to neutralize bacteria and fungal growth in products. Interestingly enough the product never wears out. Microban is used widely in the Johnson and Johnson company, Playskool, Farberware, Fruit of the Loom, just to name a few. Again when using with spas it would be aided by chlorine. The next line of bacteria fighters is the system commonly referred to as mineral cartridges or mineral filters. These are 2 metals combined to be toxic to micro organisms (but NOT humans). This is a highly effective method of sanitation when combined with ozone, Microban and trace amounts of chlorine. The very last item in the maintenance section would be what is called a 24-hour circulation pump. This is simply a pump that runs very efficiently and filters the entire body of water well over 100 times a day, every day. Now, back to your original question. In total, the amount of time you’ll need to commit to spa maintenance is somewhere between a measly 5 to 10 minutes a week. Clearly the maintenance myth is just that—a myth. Happy spa shopping! It seems that if I put down enough mulch, I don't need to weed, is it possible to put down too much mulch? Emphatically, yes. Mulch can be a help—particularly in new open beds—to control erosion, retain moisture, increase the organic matter in soil, and control weeds. On the other hand, if applied too deeply, mulch can threaten the well-being of any plant. There are two main concerns to address when selecting and applying mulch. The first concern is that the stem, or trunk, of a plant is prone to rot and insect entry when in contact with mulch or soil. Before applying mulch, check to make sure that nothing is touching the stem of any plant, and keep your new mulch well away from the trunk. You can tell where the trunk begins by locating the root “collar”. This collar is the dividing line between the roots and the stem; in general, roots can tolerate soilor mulch contact, while trunks cannot. The root collar is usually found below the flared portion of the trunk to which the roots attach, and looks like a seam or wrinkle. It should always be dry and visible. No mulch should be applied above that point. One easy way to tell when a plant is buried too deeply is that its trunk still looks straight when it disappears into the mulch or soil. The excess material needs to be removed (or sometimes the plant even needs to be dug and replanted at a higher level) to allow for the trunk to remain clean and dry. A common problem that develops when trees or shrubs are mulched too deeply is the growth of girdling roots. These roots grow from the bark of the trunk above the buried root collar, and initially lack the directional information to grow away from the stem. Many of them follow the soft mulch around the tree, and then take hold, becoming growing roots. When this happens, it is just a matter of time before they swell, hardening into a noose that, like cancer, strangles the tree with its own growth. Make sure that anyone who plants or mulches your trees understands and cares enough to prevent soilor mulch contact above the root collar. The second main concern is mulch porosity. The smaller roots that spread beyond the plant near the surface of the soil need to “breathe”. When mulch is too deep, the flow of water and air to and away from these roots is cut off. The finer the size of mulch particles, the thinner the application should be. Fine, soil-like mulch may be too thick if applied more than about 1” thick, while coarse mulch could be applied at a depth of up to 3”. When spreading new mulch over existing mulch, follow the same guidelines. Previous years’ mulch will be finer due to natural decay which, if not removed, can build up to a suffocating level. Mulch is best used in the open spaces between plants, kept to a depth that promotes air exchange as it keeps down weeds and enriches the soil. In landscaping, what is meant by the term a design build company? A growing number of landscapers are referring to their companies as design build. This means that the same company that designs the project will also install the project. Design build offers a customized approach that allows the project to receive continuous input from the designer while the project is being built. This allows the designer to effectively work through the building process in order to meet the client's expectations. From the beginning of the design process through the completion of the punch list, the party installing the work is invested in the design, which affects decisions that take place during installation. The end result when properly executed is a beautiful and functional landscape and satisfied clients. What is the difference in decking materials on the market today and what new technologies battle old problems? There are many trends and new materials in today's decking market. Homeowners are seeking to expand their living space less expensively with the outdoor room concept. They demand high-performance materials that are also low-maintenance and they want style and beauty. This is a tall order compared to decades past, when decks were made of cheap wood, often in an uninspired square or rectangle and presenting a splintery, maintenance nightmare. Now, decks must be design-integrated, withstand active lifestyles and maintain their attractive looks without much la-b or or cost for years to come. These trends have been met with a series of new man-made materials that overcome the problems of wood. All-plastic decking emerged in the early 1990s, but had heat retention and aesthetic issues. Around the same time, composite materials came on the market to battle the problems of rotting and splintering wood. But there were a host of new problems as expectations grew. These materials were a step above wood, but not completely low-maintenance as promised. They were found to hold on to stains and mildew, due to wood fillers. They were three times heavier than wood, prone to expansion and contraction and often needed pre-drilling. And, the surfaces of some prod-cuts scratched from furniture, tools or pets. It was better, but not ideal. Even though contractors achieved higher margins, they had to weigh whether it was worth the callbacks. The next generation of decking eliminates not only the problems of wood, but of composites and everything in between. A new stain-resistant decking made with cellular pvc contains no wood fillers, so it provides resistance to even the greasiest food stains, red wine, mold/mildew, fading and scratch-in. AZEK Deck leads this category, but also defines a new echelon, with the addition of flax fiber in a special process owned by AZEK Building Products. Along with stain-resistance, this gives the decking added strength and reduced expansion and contraction due to temperature changes. These features make installation easier, with no pre-drilling required, a 40% lighter weight product and two code reports (ICC and CCRR) to satisfy building permit requirements. Always ask any dealer or manufacturer if their product has a code report to avoid future hassles (to date, ours is the only decking of its kind to have these). The decking works well with typical deck fasteners and many of the quality hid-den fastener systems. It also recently met San Diego County fire requirements. With a natural wood-grain look, it is available in five colors, with matching railings, including white. In other new developments, the reduced expansion and contraction of this technology has allowed a brand new line extension: a tongue and groove porch product that can be installed in a covered or uncovered area. AZEK Porch features 1X4 planks that are very easy to install and have all the stain and scratch resistance necessary for an extremely high traffic entryway. For more information about the next generation of decking, visit www.azek.com. Every spring I look forward to warmer weather but dread the algae that I get in my pool. What is the best way to control the algae so i can enjoy my pool all summer long? To answer this question you need to understand the chemistry of algae and how it grows in a typical swimming pool. Algae are plants that grow underwater and like all plants, it requires light, oxy-gen and nutrients. If you deprive algae of one key nutrient, phosphates, it will not grow. Furthermore, if phosphates are kept low, algae will grow much more slowly. With this in mind, you want to control the phosphates in your pool. How do you do this? There are two accepted ways of preventing algae growth. The first is to make sure there are enough chemicals in your pool to kill off algae growth, or at least as fast as it is growing. This is usually done with a sanitizer like chlorine, and some type of algaecide or algistat (the chemical that kills algae). The second method combines a level of sanitizer plus chemical to inhibit algae growth. This chemical is called the “minimum inhibitory concentration” or MIC for short. The higher the phosphate level in your pool, the higher the chemical level or MIC must be. The benefit to you is this: If you remove the phosphates from pool water, algae growth is slowed down significantly and as a result, the amount of chlorine need-ed to control it is also greatly reduced. In both methods, the level of algae is being controlled by a sanitizer and some other agent that controls algae growth. But with the MIC method, you are actually removing the key nutrient that makes algae grow to begin with —phosphates. Some companies will tell you that it isn't necessary to remove the phosphates from your pool water, and they are correct—in a perfect world. However, as we all know, it's not a perfect world. Some-times it rains and sometimes the sanitizer or algistat is not added to the pool when needed. As a result the chemical level in the pool is not sufficient to pre-vent algae growth—and you get a green pool (usually on the hottest day in July!). The benefit of keeping the phosphate level as close to zero as possible is that when the chemical level in the pool drops very low it's still sufficient to control algae growth. Both methods work, but the combination of phosphate removal and low sanitizer level is much more reliable at keeping the pool algae-free! The benefit to you is that you can go away on vacation or watch it rain for a few days and know that when it is hazy, hot and humid again and you want a refreshing dip, you’ll still be able to enjoy an algae-free pool. To learn more about the choices you have in pool and spa maintenance, con-tact us at (717) 393-1600 or visit us at www.Integrity-Pools.com. What painting company do I choose to paint the exterior of my home? With the obvious bias (ha ha), I will give you some good guidelines to go by in making your selection for a painting contractor. There are three important questions that can ensure you receive a quality job that you will be happy with for years to come. What prep will be done? What will be the finish paint used? A quality long-lasting paint job begins with proper prep. In the painting world all paint jobs are not created equal. The actual painting is the easy part. Your project deserves a company that will pay attention to the dirty work on a job, like scraping, sanding and caulking. These are the elements vital to a long-lasting job. Look for a company that sells you on the prep. Make sure that the contractor is offering you the best possible finish. Most paint companies have a top-of-the line paint. Quality paints are better and more expensive for a reason. They have a greater chemical make up and years of research to ensure their durability. Like all good purchases, a little internet or store research will be helpful in educating you. Generally, the more expensive the better in the painting world, especially when it comes to materials. Lastly, make sure that your prospective contractor gives a warranty. As you know, a paint job can be a sizable investment and worthy of some security. A good rule of thumb for warranties is a year. This should cover all cracks, pops or blemishes in the finish. All top-of-the line paints carry a warranty. It is the labor end of things that you need to be concerned with. Remember, a paint job is more than just adding color. When done right, it will be an investment in the beauty and value of your home.